Pradhan Mantri Awas Yojana PMAY is a housing scheme recently launched in the year 2015 by Indian Prime Minster Shri Narendra Modi, this scheme was previously called as housing for all scheme. This is a housing scheme for urban areas which are being managed by running by Ministry of Housing and Urban Poverty Alleviation. Indian government has been already given permission or approval notice for construction of lakhs of houses. Credit linked subsidiary scheme is the one of the part under Pradhan Mantri Awas Yojana (PMAY) Scheme. Download PMAY beneficiary list is not possible but you can check PMAY Beneficiary list through online. The main theme of this scheme is that to provide housing for all people in India by 2022. Indian Government has taken construction of 20 lakhs of houses in urban areas all over the India. About 18 million houses in 20 million houses will be developed to slum and remaining 2 million constructions of houses will be given to poor people in urban areas. Apply for Pradhan MantriAwasYojana through online is very simple process. Download PM AwasYoujana beneficiary list is not possible but you can verify through online. The government was identified 2,508 cities and towns across 29 states in our country and our Government is going to construct approximately 2 million houses in urban areas for Urban Poor People. 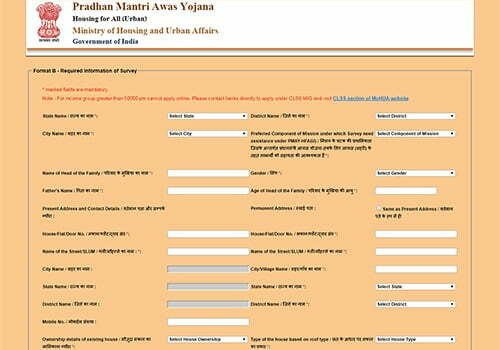 Pradhan Mantri Awas Yojana PMAY online application forms are available at official website of Pradhan Mandri Yojan Scheme ‘www.pmaymis.gov.in’. Interested candidates can apply for PAMY at official website and applying process is given below. In the property ownership, it is mandatory to one adult female membership. You or your family should not have own a puccahouse in any area of the our country. Your family members should not have to register house on either in his name or any of his family member’s name. Here, family means husband, wife, unmarried sons and/or unmarried daughters. Applicant should have 3 lakhs salary per annum while applying to EWS scheme which is Under Eligibility Criteria of PMAY. Applicant must have an annual income up to Rs.3 lakhs. At the end of the repayment period 70 years of age is the maximum age limit. You or your family should not have own a pucca house in any area of the our country. Adult female ownership in property is important. in case of Repair and Renovation it is Applicable. All bank accounts and loans should linked with a aarhar while applying for PMAY Under MIG. linkAadhaar to All loans accounts under apply for PMAY Under MIG. First open official website of PMAY or open https://pmaymis.gov.in URL in your Favorite Browser after Opening the Given URL. You will see the home page of Pradhan Mantri AwasYoana. After opening home page, go through “Benfit Under 3 Components” Under “Citizen Management” as shown in below Picture. If the provided information by you is correct, you will be redirected to next page containg a big form other wise no change in the page will occur. Then fill the form with necessary details such as DOB, Name, age, and etc. After filling the all the blanks with your personal details put a tock mark on check box and enter the Captcha provide on the box. Finally, proceed though save button as shown in the figure to register on Pradhan Mantri Yoajana scheme or apply for Pradhan Mantri Yoajana scheme. That’s it just follow the procedure to apply for PMAY scheme. This is the second process of applying for PMAY scheme. The detailed process is given here. First open official website of PMAY or open https://pmaymis.gov.in URL in your Favorite Browser after Opening the Given URL. You will see the home page of Pradhan Mantri Awas Yoana. After opening home page, go through “Benfit Under 3 Components” Under “Citizen Management”. After going through the “Benfit Under 3 Components”, a page will open asking your aadhar number just enter your original aadhar number on it to apply for Pradhan Mantri Awas Yojana PMAY, and proceed to further. If the provided aadhaar number is correct you will be redirected to next page contains a big form other wise no change in the page will occur. Here, you can check application status of PMAY by two methods there are first one PMAY status check by Application ID and another one is PAMY status check by Assessment Number. Fist open “http://pmaymis.gov.in/Track_Application_Status.aspx” after opening the given URL a page will open containing two options first one PMAY status check by Application ID and another one is PAMY status check by Assessment Number as shown in the below picture. Select the second option to check PMAY status of application. Then a page will open then fill the page with necessary details. Then proceed with submit button to check status of PM awasyojana application. That’s it follow the above process to trace or check status of your PMAY status. Select the first option to check PMAY status of application. Then the page will redirected to a page containing small form. Fill the page with necessary details to check PMAY status of application. Then enter your Application ID (obtained during filling the application for PMAY). Set up Google Alerts to Monitor Your Stocks & Shares and etc.